The debutalbum of a musician from the city of Oryol, Russia, released with the supportof ZHELEZOBETON label. “Invisible Landscapes” is dark ambient recorded with atypical Russian approach combining homage to native traditions, deeplymelancholic contemplation and powerful thirst for the beyond. Dark red embers,twilight, wind sways over tree crowns, lost eyesight of the consciousnesswandering in forest labyrinths and gradually dissolving in the infinite circleof life and death… Rich sound of Soviet analogue synthesizers, a bit of fieldrecordings, voice samples and digital processing – this is the pallette usedfor creating this image. 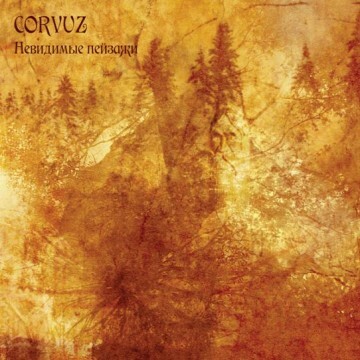 It feels that the music of CORVUZ is inspired by theproject STARUHA MHA, a cover-version of its track rounds up the album. Thealbum was mastered by Sergey Uak-Kib (Kshatriy), artwork performed by SergeyIlchuk (Siyanie, ex-Vetvei & Vresnit Art).